I have got to stop listening to self-help books on audio instead of reading them. So much of the advice given is lost on me as I try to keep up with the narration while folding socks or commuting or whatever and I struggle to retain any of the information presented. That is probably the main reason I have so few take-aways from this book. It was full of solid advice but I don't have much confidence that it will affect my writing much. How much of that is the fault of the book and how much of it is the result of the way I accessed that book is hard to say. Brandon Sanderson and Dan Wells have talked about David Farland multiple times on their wonderful podcast, Writing Excuses. Both of them credit him for much of their early success and have encouraged their listeners to take classes from him whenever possible. After listening to this book I can see why because the advice is no-nonsense, practical, and success-directed. There is no concern for art for art's sake. It is a book about making your writing commercial and successful, not about making yourself an artiste. Thank goodness, because I hate pretentious literary crap and I would never want to write it, so this is definitely a good approach for someone like me. He had good advice, what I can remember of it, about how to write for your audience and he breaks down the main interests of that audience by gender and age. I didn't agree with his points 100% and thought he was more than a little sexist but, political correctness aside, he's not far off the mark. One place I thought he was a little gender-blind was when he said that women and girls prefer to read about female characters but never acknowledged that women are much more willing to read across genders because they have almost no choice in the matter. There is a reason that J.K. Rowling used initials to hide her gender and wrote about Harry Potter and not Hermione - girls will read boy books but boys will emphatically NOT read girl books. But that's a subject for another day and another rant. For a book that calls itself Million Dollar Outlines, there was very little practical advice about how to outline. Most of the book was spent breaking down what makes a movie successful and much less time was spent in giving step by step advice for how to write an outline. The audio book really suffered from the lack of visuals, too. There should have been an accompanying PDF to show the reader/listener the charts and so on from the book. 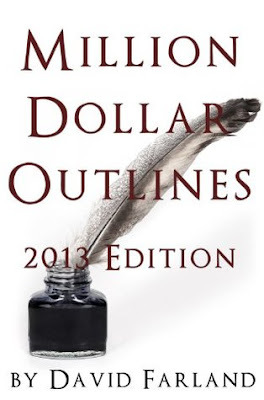 I'm sure this book will be useful for people in a certain place in their writing trajectory, but for someone like me who can't plot at all, it was more entertaining then helpful. I liked the parts about character development the most but wish I had been able to glean more ideas for how to plot and outline. Maybe I should get the print version and give it another try. Not all books work well as audio books and that's not the fault of the book but the format. I would be willing to come back to it again in print. Judging by audio alone, it's a 3 1/2 star listen.